Brief Synopsis – A small town sheriff awaits the arrival of a trio of bank robbers who have been on a killing spree through a few states. My Take on it –This is a film that I’m quite surprised that I never saw before. The way that the tension is built up works so well and it keeps raising the level of anticipation as things move forward. The best thing about it is that nothing feels rushed at all and we are able to absorb everything that is going on as things keep building up to the eventual meeting between the two sides. 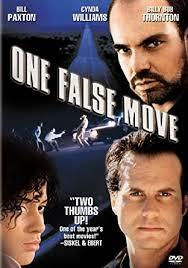 Bill Paxton and Billy Bob Thornton play the two leads here and are both now well known leads but when this film was made in ’92, neither of them were really known as leads and the casting choices were right on the mark. The pacing of this film works extremely well and it helps to keep the suspense level slowly rise as things move along. This is such a gripping thriller that doesn’t get as much as it deserves. It’s not a perfect film, but it definitely comes close to being that. I really can’t wait to see this one again soon. Bottom Line -Great premise that keeps the tension high the entire time. Paxton and Thornton are both superb despite neither being so well known as leading men at the time. The pacing works really well in order to keep the suspense level on the rise since we aren’t really sure what will happen when both sides eventually meet up. Not perfect, but still a gripping thriller. Highly Recommended! I saw this when it first came out and have seen it a few times since. It’s a knockout. If violence bothers you (especially in the early scenes with the home invasion), it may not be for you – but it’s a gripping ride. Terrific performances from its entire cast – some doing (IMO) some of the best work of their respective careers. From first frame to last – this film is terrific.